FOX Sports will deliver 23 hours of LIVE coverage across the FOX family of networks for the Second Annual Hot August Nights Auction presented by Barrett-Jackson in Reno, Nev.
All of the glamour and action will get underway on Thursday, July 31 at 7 p.m. ET on FOX Sports 1. "Many years ago, Barrett-Jackson created a whole new model when it comes to the collector car auction as family entertainment," said FOX Sports reporter Bob Varsha, who has covered every Barrett-Jackson Auction since 2001. 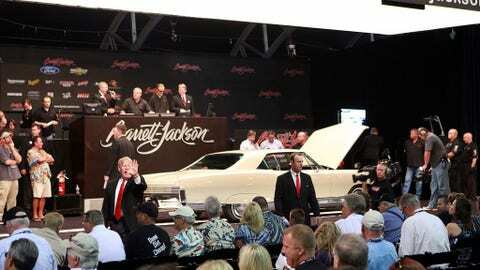 "Sure, it’s all about buying and selling cool cars, but whereas the auction process was once, and in many cases still is, formal and inaccessible by the larger car enthusiast public, Barrett-Jackson turned the auction into an affordable and welcoming event; a festival with a car-culture theme. "At the same time, the folks in Reno-Tahoe, famed as ‘The Biggest Little City in the World,’ built up what you might call ‘The Biggest Little Cruise-In in the World,’ with thousands of fabulous vehicles on display, cruising, and even racing. Bringing Barrett-Jackson and Hot August Nights together has created an event for the car enthusiast that can’t be found anywhere else and certainly has to be seen to be believed. That’s where we come in as a band of car-crazy TV gypsies." "The evolution of car collecting into a mainstream hobby has been accelerated by our live television coverage over the years," said Craig Jackson, chairman and CEO of Barrett-Jackson. "Our broadcasts give consignors the largest possible market for their cars while providing bidders unprecedented access to the best vehicle selection possible. Once people sample Barrett-Jackson automotive lifestyle experiences from the comfort of their living room on FOX Sports, they want to enjoy the full throttle events in person." Additionally to the festivities will be the ever-popular Hagerty Fantasy bid, where viewers at home can guess what price various cars will sell for in an attempt to win prizes. Also, custom car builders will be competing in the relatively new and well-received contest known as the Barrett-Jackson Cup, where plenty of bragging rights will be on the line as some of the world’s greatest custom car builders will come together to battle it out for a $30,000 grand prize.